Release Date: January 26th, 2007 by Samuel Goldwyn Films. The Cast: Pierce Brosnan, Liam Neeson, Anjelica Huston, Michael Wincott, Ed Lauter, Robert Baker, John Robinson, Kevin J. O'Connor, Tom Noonan, Angie Harmon, Xander Berkeley. Directed by David Von Ancken. BASIC PREMISE: After the Civil War, Colonel Carver (Neeson) and his men hunt down Gideon (Brosnan) in order to exact revenge on him. 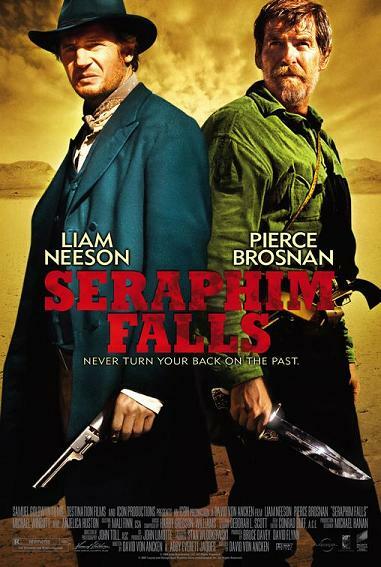 ENTERTAINMENT VALUE: Seraphim Falls essentially begins in the second act as Colonel Carver and a few of his men chase Gideon through the snowy mountains of Nevada. The suspense comes from two difference sources. Firstly, Gideon may or may not be able to survive, especially given that it’s him versus three other men. Secondly, there’s the overarching mystery of why Carver wants Gideon dead in the first place. Pierce Brosnan and Liam Neeson both sink into their roles with ease and play off of each other quite well. Brosnan, almost unrecognizable with his scruffy beard, allows you to forget that he once played James Bond. The only scene that feels awkward and diminishes some of the plot’s momentum is during a bizarre mirage in the middle of the desert toward the end of the film. On a positive note, co-writer/director David Von Ancken wisely chooses to gradually uncover the events of the first act that happened prior to the lengthy chase. This allows for a few surprises regarding who you end up perceiving Carver and Gideon because, as you learn, there is more to them than meets the eye. It’s also worth mentioning the picturesque, breathtaking scenery and beautiful cinematography which help to make this glorious Western feel equally authentic and engrossing. SPIRITUAL VALUE: None, other than the brief questioning of whether or not revenge truly helps to cure one’s anger and frustration. IN A NUTSHELL: Glorious. A thoroughly suspenseful, engrossing and breathtaking Western.